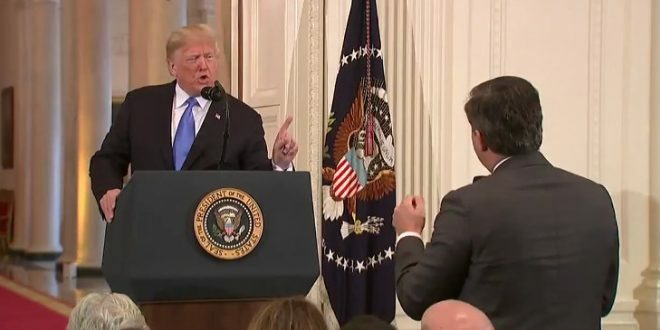 CNN Sues Trump Over Jim Acosta's WH Credentials - Joe.My.God. CNN is filing a lawsuit against President Trump and several of his aides, seeking the immediate restoration of chief White House correspondent Jim Acosta’s access to the White House. The lawsuit is a response to the White House’s suspension of Acosta’s press pass, known as a Secret Service “hard pass,” last week. The suit alleges that Acosta and CNN’s First and Fifth Amendment rights are being violated by the ban. The suit is being filed in U.S. District Court in Washington, D.C. on Tuesday morning, a CNN spokeswoman confirmed. Both CNN and Acosta are plaintiffs in the lawsuit.